Adventures in the Endless Pursuit of Entertainment: L’Elisir d’Amore = Delicious! L’Elisir d’Amore at the Met was just delicious! Barry Banks was in as Nemorino. He was just as cute as could be in the role. He sang it fantastically as well. Angela Gheorghiu as Adina was lots of fun. I loved hearing her voice in this style. The set looks like a children's chalk drawing and the Met chorus looked ready for Easter sunday in bright spring colors. It was like swimming in cotton candy. This was my third Donizetti "comic" opera and it was nothing but pure fun. I love walking out of the Met amongst all of the smiling people. You can't help but cheer up with this fun. I absolutely loved the broadcast of this opera! I had heard it from the Met before, and I think it is one of my favorites. To me it does not really sound like something by Donizetti, which is probably why some of his other operas such as "Lucrezia Borgia" and "Maria Padilla" have journeyed in and out of the standard fare with the rest of his over 60 other operas (I suppose we shall not see a complete box recording of his operas for a while...). I hope Rolando Villazon comes back to performing soon. When I heard him moderate the Opera Quiz earlier this season, he was full of energy, and I thought how fortunate we were to be able to hear him as Nemorino, a role that requires a great comic actor as well as a grand singer. Barry Banks seems to me a solid tenor of sincere artistry. I look forward to hearing him next season, where I believe he sings opposite Renee Fleming and five other tenors in the new production of Rossini's "Armida." 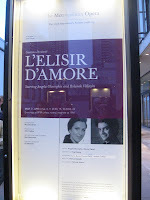 L’Elisir d’Amore sounds a lot like Il Barbiere and even La Fille.